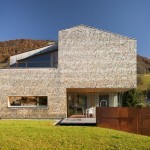 LP Architektur have designed the House Pilotto in the town of Sankt Johann im Pongau, Austria. 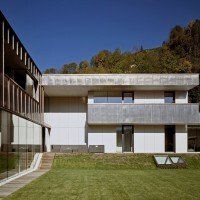 The concept of “House P.” arranges the required living space in three main, functional zones. 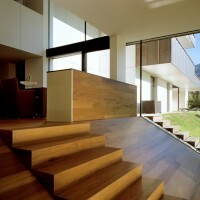 The western part of the first floor is dominated by a circa 90m² wide space, serving as place to eat and living room. It is zoned by means of an offset in height. Entering the house in the eastern part, the family enjoys the orientation of living to the south (living room) and east (kitchen and eating). 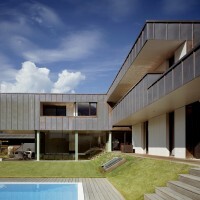 The eastern part of the house holds a wellness area which is directly connected to the pool located outside in the garden. A wide gallery creates airy space on the second floor level. It defines relations between the most private rooms (sleeping rooms) – open and distanced at the same time. Even a place to work is included into this structure of private space – by means of the gallery it get´s the distance it needs to be a place for concentration. 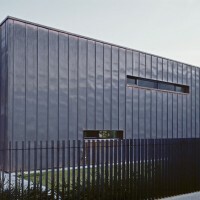 The gallery is also readable on the façade, by formulating open and more closed parts. 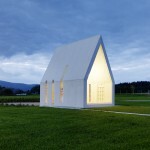 Visit the LP Architektur website – here.